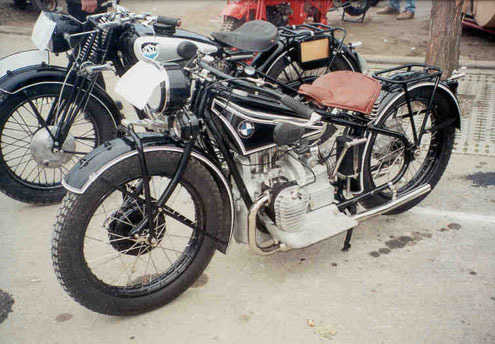 I found this early BMW twin for sale in Germany in 1999. I really liked it and came back to it several times during the three days I was there. I was fortunate just to be at the show though - never mind being in a position to buy the bike! At the same meet was this incomplete R42, also for sale. By the time I found the bike it was already sold. 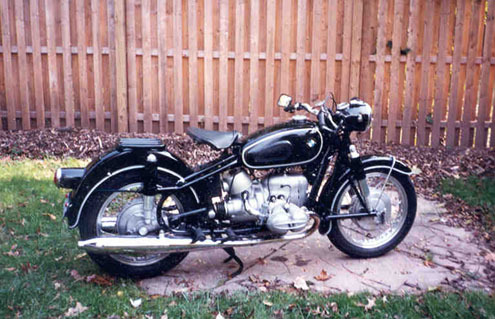 The Steib S250 was unique in the Steib lineup in that the body was made up from some rather large steel stampings, with a seam up the middle. You don't see many of these in North America. I photographed this Steib in Germany, mounted to a very clean R69S. 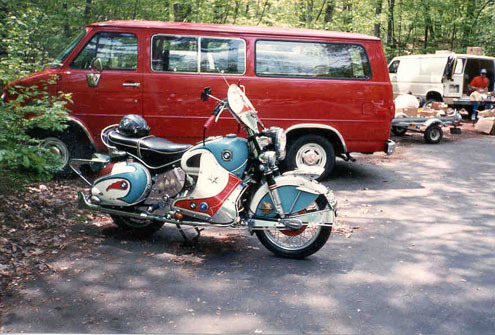 This clean looking Steib S500 & 1958 R69 combination was at the 1999 Rhinebeck show. 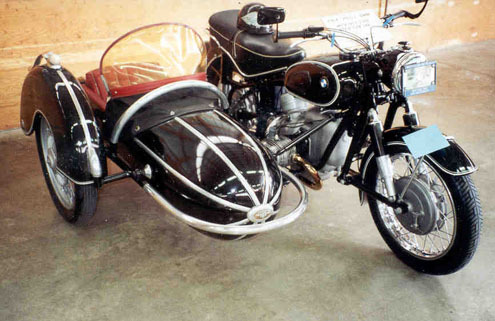 What's interesting about this Steib is that it was originally sold for use on a Zundapp. 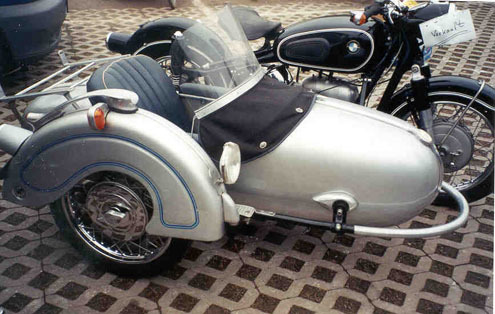 The oval ZUNDAPP emblem can still be seen on the nose of the sidecar, and the sidecar wheel is also a Zundapp item. 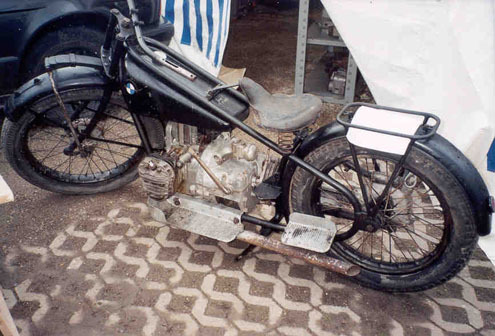 Shortly after I got my R50S I discovered that the ring and pinion in the bike was not usable. This was real disappointing because the R50S-only 7/25 ring and pinion is a one year only part. 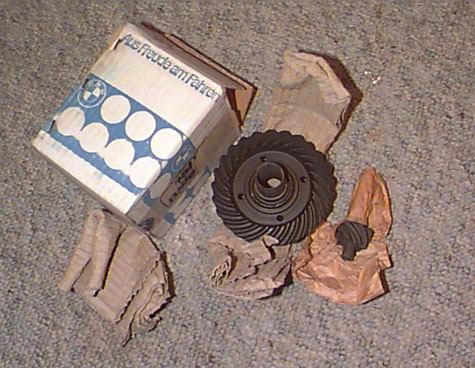 Well it took a bit of digging around, but my luck has been holding out in that I found a set of original NOS 7/25 gears collecting dust on a shelf at an old dealership. This find was cause for a small party that night! Say what!? 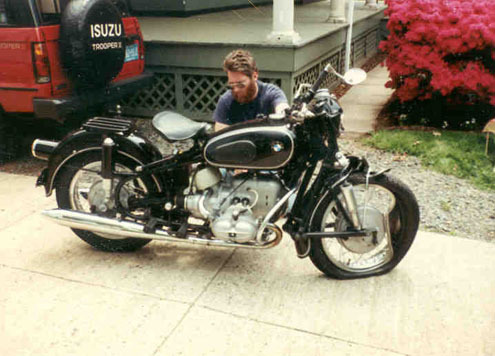 Someone gave me this photo, and I was half tempted to say "Thanks, but no thanks" - but then that IS my old van just behind the bike, so I might as well hang on to it for that reason! The bike is known to those up in New England as "Blue Max", and believe it or not, somewhere under all that stuff is an R50S! A few months later his Friday evening ride was interrupted when someone made a turn right in front of him. Luckily he didn't get too banged up, and the accident happened just two blocks away from a hospital! Once he was back on his feet the R69S was repaired and back on the road in no time. 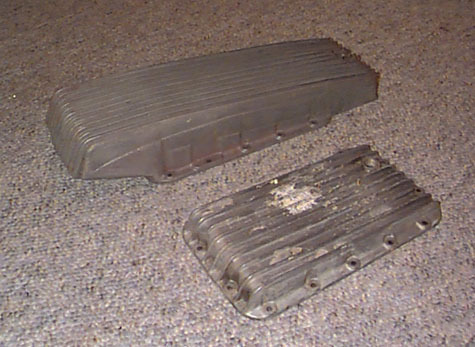 The large pan in this photo is a Fallert oil pan - seen here next to a stock /6 pan. The Fallert pans were made in Germany, and they came on the scene around 1980. They were always expensive, so not that many were sold - and not that many people know about them today. Here's a top view of the same pan. Besides adding a lot of oil capacity to your engine, the Fallert adds a very aggressive look to your /5 to /7 twin. 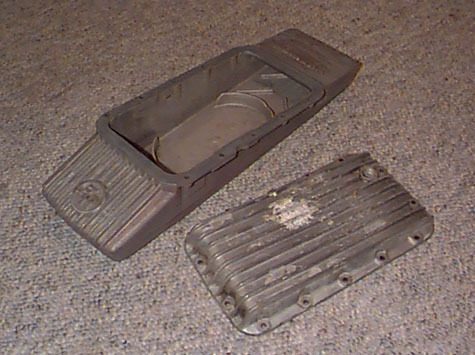 They were offered in both aluminum and magnesium - this is the aluminum version. This pan is for my 1977 R100RS.